As an established nonprofit, the Symphony was able to secure a grant to run free PPC ads on the Google AdWords platform. While the ads would cost nothing, the Symphony still needed a team of digital advertising experts to write, manage and update their campaigns to ensure maximum efficiency — and maximum sales results. 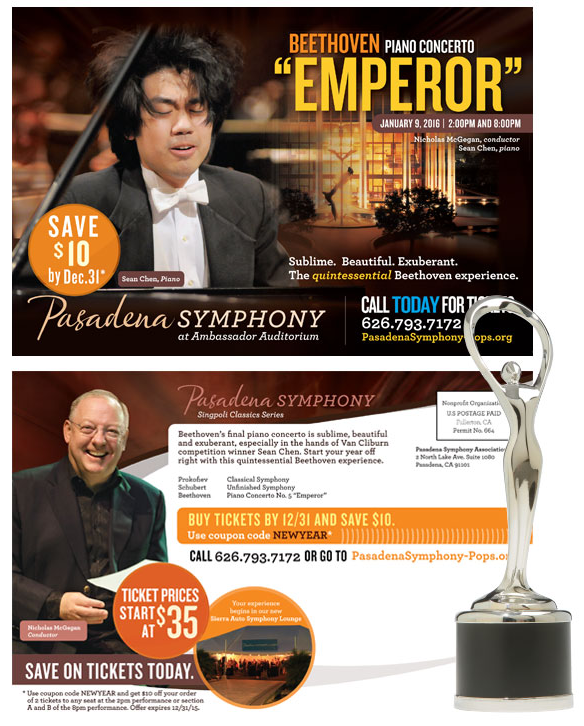 As a long-time client, we have extensive understanding of the Symphony’s year-round marketing plan and sales goals. That information, along with our own extensive background in arts marketing, allows us to create efficient and effective PPC campaigns for both well-known and more obscure concert events. Since taking over the Google Grants campaign in 2014, Counterintuity has helped Pasadena Symphony and POPS promote more than 40 concerts, amassing 46,356 clicks, 1.65M impressions, and an impressive 2.81% click-through-rate. The cost of these ads would have been over $69,000 – what did the Symphony pay? Zero.